Bomajoe has been hard at work dethroning me from any and all top spots I hold for our FNG group in TrackMania. To put the icing on the cake, he nailed a 27,000+ score on Rally A4. He's currently 60th in the World on that track and only 0.17 seconds behind the #1. GG! My highest has been a 22,000+ on Island C2, followed by DirtyDan with 17,000+ ... so kudos to Joe for having the highest solo track score in Team FNG... the gauntlet has been thrown, who will top it? TrackMania 2 to be Doomed by Ubisoft's "Online Services Platform"?!?! Ubisoft is quickly becoming the bane of my existence. I hate to say it, but they are. It's too bad really, because they have some fantastic games that I've really enjoyed playing. But as most of you know, I've been boycotting them for about a year now over their stupid decision to start releasing continuing content DLC to exclusive platforms. Today I find out they are releasing an "online services platform", a seemingly Steam wannabe which they spin as sounding good in the fact that your personal saved games will now be saved "in the cloud" so you can install and play your same games on multiple machines. All future Ubisoft games will be distributed to PC through this mechanism. Gone are the days of deciding how and when you can play a game that you purchase... but don't worry, the gods of Ubisoft will dictate that for you. Epic Fail. I'm most upset about this because it will affect the game I'm anticipating most right now... TrackMania 2. 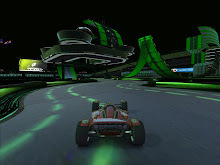 See the discussion I started on the TrackMania Forum and feel free to sound-off here and/or there... Then start speaking with your wallet, and cease buying Ubisoft games until they stop the madness and quit penalizing us for supporting their efforts. Send the message loud and clear that we'll support them when they return to letting us play our purchased games when/how we like... not on their terms. Yes, I'm serious... better get them fast, cause they won't last long! If you're looking to get it new, or to obtain extra multiplayer keys for your kids, friends, etc. now is the time! Buy TrackMania United DVD from iNetVideo while supplies last!